Insanity's Solace: Campfire Morals: The Original W. G.
Campfire Morals: The Original W. G.
This is a (hopefully) better and longer version of the speech I gave in Toastmasters on 12/5/2012. So those of you who were there will know what's going on. I'm going to not do the usual "The Moral" portion at the end because I feel the ending of this speech I gave is powerful enough without it, but maybe I'm just thinking too highly of it. As many of you reading this may know, my full name is Wesley Golfe Davenport. Whenever I mention my middle name it brings up a lot of confusion because I have yet to meet someone who has ever heard of Golfe (pronounced golf) as a middle name before. I was actually named after family... both sides to be exact. Since I get my last name from Dad's side automatically, that wasn't enough to really state that I'm named after that side of the family. Since my grandfather and father are both named Charles, Dad didn't want to name me Charles as well so he went back a few generations and found that there was a Wesley in his background. So where does Mom's side of the family come in? Well there-in lies my mysterious middle name. Mom's father's name was William Golfe Whitley (though not many people knew his middle name as far as I know) so even my first name came into effect with her side as I was now the second W. G. in the family. But this isn't about me, this is about the original W. G., Bill Whitley, or Papaw as I called him. Growing up, I was closer to my father's parents overall. This was entirely logical because Mamaw and Papaw lived twenty minutes away while I could see Granny and Pappap's front door from my bedroom window but that didn't mean there wasn't just as strong a connection between us. In fact I see certain similarities between me and my Papaw when I really sit down and think of it. That's one of the first things I say when someone asks me what kind of person my Papaw was. I tell them first to look at me. Then after they are done vomiting out of disgust, for them to examine some of my character traits because several of them are shared between us. One of the big things that can be seen that we share is a great love of having a good time and making jokes throughout the process. When I think about Papaw, I honestly can't think of hardly any time that I spent with him that there wasn't at least one or two moments of laughter between us or the whole group. He seemed to be always looking to mess with something whether it be sticking his dentures out at the kids, or making fun of a deer someone had shot with his classic "Eeeehhh gosh!" before pointing out how small the deer was even it if was a very large buck. There were few things that he couldn't find some way to get some form of chuckle or elbow nudge out of the situation. Even in pictures you can see his humorous personalty showing through like the one below with the expression he is making. 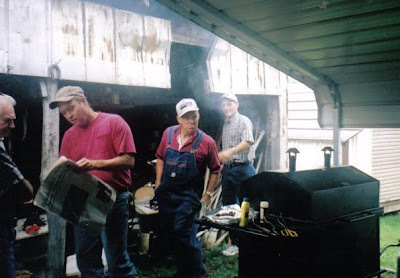 To tie in with the picture above, you can see Papaw in front of a grill. That is one other thing that the two of us share is a love of food. Now I personally cannot cook that well probably because I haven't practiced much but I can definitely appreciate the art of cooking and turning raw ingredients into something wonderful. My Papaw was an amazing cook. Very few people have even come close in comparison to him and his dishes, and I always enjoyed watching him cook even if it was just for a moment. Deer Burgers, Grilled Chicken Breast, Deer Jerky, Cajun Fish, Stew, Chicken Bog, Christmas Ham Biscuits: all these were so flavorful and amazing that my mouth waters just by thinking of one of them. He liked to create his own spice mixture and special ingredients for his dishes, most of which he kept a secret as all good cooks do. He was definitely one of the best. Those are just two of the ways that we are alike. Other ways are things like love of family, desire to help others, love of children etc. The list goes on and on but for sake of time I'll leave it as it is. For those of you that know me well enough, it goes without saying that looking at me won't give you an accurate depiction of my grandfather because there are a few differences too. The biggest difference between us is that Papaw was a natural outdoors-man. He loved being out on the lake fishing or out in the woods hunting deer or turkey. To see Papaw indoors for extended periods of time was a very rare sight as he always had something to do out there. He also enjoyed aiding in making the food he was going to produce. Dressing the deer himself, and helping others make sausage from the slaughtered pigs. He loved baseball and every Sunday that a game would be on he would be watching it out in the den as opposed to me who will watch sports if someone else just wants to... or it's the Super Bowl. 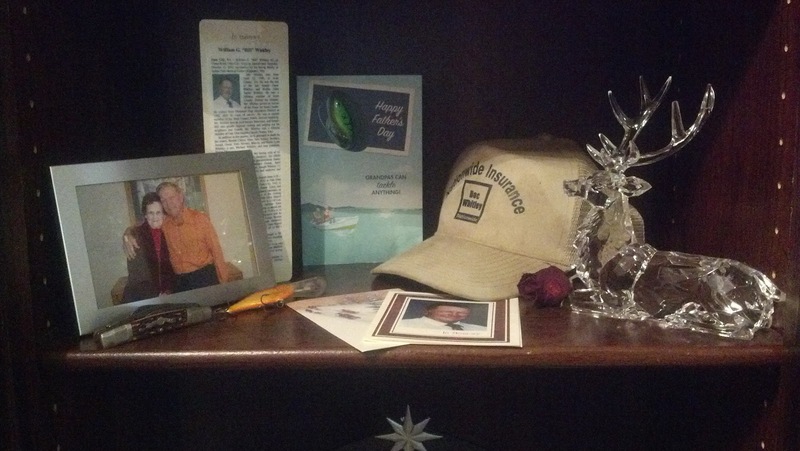 He was a true Southwest Virginia Country boy, not some "city" nerd like me. Two of the greatest things about him that always inspired me to be more like him was his love of life, and his willingness to help anyone out. 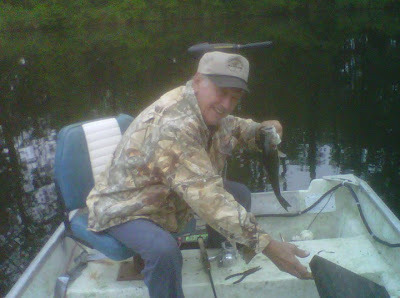 Papaw loved life and was very active in it. I dare say you couldn't have found a more animated character in your life. Throughout the good times and the bad, he always made the best out of whatever life dealt him with a happy demeanor. The man never sat still. He was always up and about the town seeing and doing and talking about anything that he could. You could probably try to go to his house three days in a row and not catch him at home either time because he was somewhere else doing who knows what... till lunch time at least. For a man in his early 80's you would have thought he was in his late 50's with as much as he ran around town and the house doing anything he could and staying active till he literally collapsed with exhaustion. While he was constantly out doing things here and there, he would always help out anyone who needed it. Whether it be a friend down on his luck, a neighborhood boy making bad decisions, or his church needing work on the building; he was always first in line to help. He would do anything he could to make your day better or help lead you in the right direction. Papaw was a very wise man who knew just what to say and how to say it. I wish I had listened more to him. He knew things and no matter what trouble you had or what you needed to fix he had a solution or at least something to attempt, and he would be right there showing you how to do it, doing it with you, or "supervising" with a smile. When i think of the epitome of kindness, charity, and wisdom, I think of my Papaw. I don't think I've ever met a soul who loved life anywhere near as much as him, nor do I think I ever will again. As further proof of this, I was lucky enough to take a very dark but very audible video of him and my cousin Lindsay back in 2003. Just what little he had to say to her in this even though it's just playing with her tells of his character and liveliness especially on his face. In September, the world as we knew it changed. Papaw had gone for a regular colonoscopy. Nothing was strange, nothing was abnormal, but when they removed a part of his colon, the wall remaining was just too little and it burst open. Papaw went to the emergency room where they took him into surgery to fix the problem. However things kept getting worse. He was having trouble waking up from being put under anesthesia twice in one day. He was having trouble breathing because of that and was put on life support just in case. The days dragged on as he would have better days then take a nose dive. We were finally called in to talk to the doctors. The doctors gave us three decisions. We could take him off life support entirely, leave him as-is, or attempt one last surgery that might work. The doctors left and we began to talk about things. As we were talking Papaw began to become the most conscious of our presence in awhile. He looked at Mamaw and noticed us around the room. The decision was made that because he was always so lively that we would attempt the surgery so that we can say we did everything we could to bring him back to us without prolonging suffering. So the decision was made and Papaw continued to be conscious of us being there. After I left, my cousins say that he winked at them, and acknowledged what they were saying. They told him we were taking care of Mamaw and he understood. He was interacting the best he had done since he went to the emergency room the three weeks before. 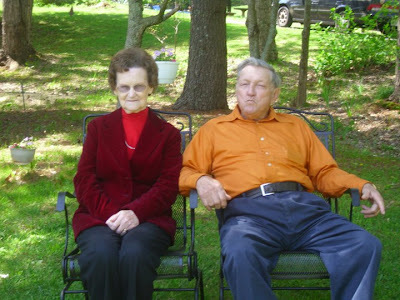 It looked like we might possibly be able to get Papaw back and have his energy and livliness with us again. He might be getting better finally! But he never did. As I heard of how well he was doing that day, I was afraid it was the "last hoorah" and it was. 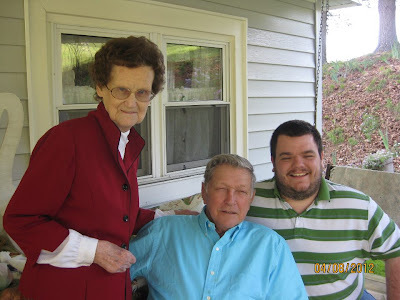 On October 13, 2012, Papaw left this world to be with our Heavenly Father. As we stood in line at Oak Glen for his funeral, we met many people from all walks of life of whom he had been well known, or even touched their lives in one way or another. Everyone talked of what a wonderful man Bill Whitley was. I couldn't help but think of how one man's life can influence and touch so many. I truly hope that one day this W. G. can leave the same sort of legacy as The Original W. G.